In 1910, Novi Sad hat 33.590 inhabitants, approximately 7.000 of them Germans. From 1919 onwards, Novi Sad turned into the economic and cultural centre of Germans in Yugoslavia. They started to form associations and in 1919, the first newspaper of Germans in the Kingdom of Yugoslavia was published. In 1922, the central agricultural credit union Argaria was founded. To accommodate the different political, economic, cultural and societal associations of Germans, a central building was established. 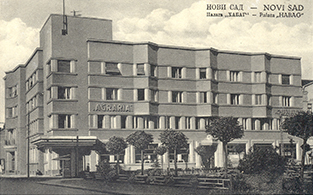 In 1929, Josef Menrath initiated a public company for the building and the construction work of “Habag” House began. It was designed by architect Oskar Pakwor and master-builder Philipp Schmidt and turned into a centre for the Germans in Vojvodina, hosting important cultural and societal events. The building however only fulfilled this function for 13 years. 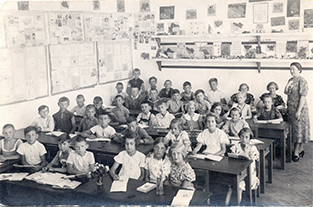 After the outbreak of World War II the cultural and societal life of Germans in Novi Sad was extinguished. After October 1944, only 300 Germans were left in Novi Sad. The palace was demolished in a bomb attack, a reconstruction can be found in Vase Stajića 2. German form in Novi Sad, approx. 1930.